Teaching in Mexico City: Wow! Here’s what blew me away. First off: I can’t tell you much about pole dancing classes in Mexico, because I didn’t get to explore the local pole dance scene as a student. How on Earth could I spend 4 weeks in Mexico and not visit a single pole class? Long story short: I backpacked through the south of the country with my boyfriend and I got sick after diving for almost two weeks. When I arrived to Mexico City I was really just hoping to have enough strength for my own workshops after 3 weeks of pole break. It was also the first time I gave classes outside of Germany. Not even in my wildest dreams I’ve ever imagined that TEACHING ABROAD would be so mind-blowing. From 2 initially planned workshops, we filled up 5 at the end! When I wrote an email to ThePoleDancer list that I’ll be teaching in Mexico City, I didn’t really expect much. So, every „See you there!“ response was a very pleasant surprise. However, not knowing who I’m going to meet in class, is new to me. I was trying to guess the entire time how many of the girls I know already from writing. I felt like a Pole Star, and at the same time I was totally overwhelmed by that feeling. 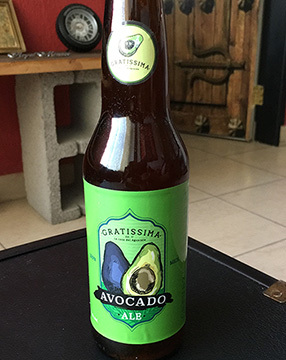 … I’ve ever got, was this avocado-beer, that one of the girls brought for me from her home town – Michoacán. Which again was 5+ hours drive from Mexico City. I got more small gifts from students and studio owners, as well as tons of recommendations for what I should visit, eat and drink before I leave. The girls really appreciated the fact that I was traveling through their homeland and that I was interested in their culture, nature and people. Indeed, my most remarkable memory of Mexico City is definitely the people I met through my workshops. W&A Studios is located in a beautiful, white painted house. It looks like a regular residential house from the outside, no ad sign indicating that it’s a pole dance studio. However, from the moment you enter, you feel welcome and you can see the work and thought put in details. It’s personal and familiar. Unlike most pole studios, W&A Studios isn’t a one big space with poles on one side, and mirrors on the other. There are only 4 poles, distributed in the 3 rooms. I had to rethink how I lead the class, so that everyone could follow along during the choreographies. And it worked fine. The big advantage of this kind of space is that there’s literally room for exploration and experimentation. And we took advantage of this in our dancing exercises. I had the pleasure to inaugurate with my workshops another cool pole space in Mexico City. Urban Street Art/Food/Rock’nRoll meets Pole Dancing. Rabioso houses concerts, restaurants, skate park and an art gallery. And it’s now hosting also pole workshops (CobraFit), and soon – regular pole classes. Although the poles have just been put up, it already makes a very professional impression. Probably because the three female founders bring along a good mix of experience in pole teaching and event management. Do you remember your last pole dance workshop? What motivated you to go? Did it meet your expectations? Im still smiling because this was one of the best experiences! Thank you so much for coming, you teach so beautifully and you make it seem so effortless. Thank you for everything. For us, you are definitely a pole star!